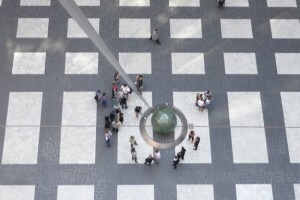 Three Month Check-Up – Reflections on the First 90 Days of the Trump Administration A Panel, featuring Jonathan Haughton (Economics), Christina Kulich-Vamvakas (Government), Rick Beinecke (Public Administration), Jeppe von Platz (Philosophy/PPE). 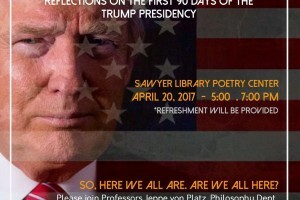 Place: The Sawyer Library Poetry Center Time: 5-7PM, Thursday, April 20th 2017. Post-election panel was a success! Our event “What Just Happened?! 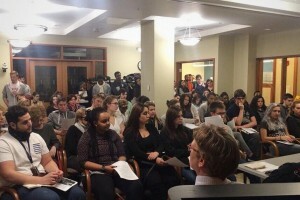 ?” was a great success – with more people showing up than the room could hold. Great work by the PPE Student Advisory Board who organized and advertised. 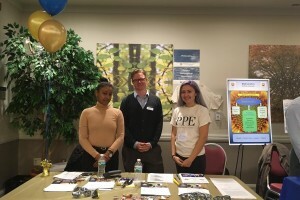 Director Jeppe von Platz and PPE Student Advisory Board members Helina Dawit and Madison Mignola represents the PPE Program at the Suffolk University Showcase, October 2016. Interest in the program was high! The Next PPE Student Advisory Board Meeting will take place 12.15-1.30pm, Tuesday, September 27th. We’re meeting in 73 Tremont, Room 1098. Interested in joining the PPE Student Advisory Board? We have two info sessions on Tuesday, September 20th: 1. 12.15-1.30pm in 73 Tremont, Room 1002 2. 3.10-4.30pm in 73 Tremont, Room 1098 For more info, email Grant or Helina. The student advisory board will convene at 12:15pm on September 16th. Email one of the co-chairs (Helina and Grant) if you have something you’d like on the agenda. Student Advisory Board Meeting – February 23rd, 1pm In room 1002, 10th floor of 73 Tremont. Student Advisory Board Meeting: Thursday February 11th, 1pm, 10th floor of 73 Tremont. 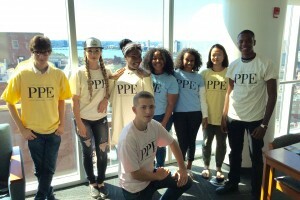 The first PPE Student Advisory Board now exists. You’ll find a list of its officers here.